The easiest way to create GUIs in Python. Written by a teacher, in the classroom, for students. appJar is designed to run on as many versions of Python as possible - so it should work in your school. There are no other dependencies - simply download, unzip, and put it in your code folder. Check out the installation instructions for other ways to get appJar working. 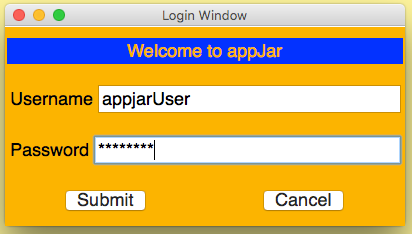 GUIs in appJar require three steps. First, import the library & create a GUI variable. Of course, the whole point of making a GUI, is to be interactive - this requires events. The idea behind event-driven programming is that each time the user clicks or types (an event) the GUI should respond. When the user presses a button, the press function is called, passing the name of the button as a parameter. All the different input widgets & output widgets available. Our support for images and sound. How to include toolbars, menubars & statusbars. How to create simple pop-ups. How to use a grid layout. How to use containers for more advanced layouts. In the upcoming 1.0 release, we're formally introducing a new set of options for buiding your GUI. Context Managers allow you to create the GUI and any containers, in a visibly more understandable way. New functions that allow you to add/get/set widgets all with the same command, including passing configuration paramters. New properties for configuring the GUI.